Blogs are a good way to build credibility and promote your Emporium. You can use blogs to tell buyers about your business and to demonstrate your expertise. Blogs are a good way to also create content that is rich in keywords. This can help your Emporium rank higher in search results. This tutorial will show you how to create a blog. In its simplest form, a blog is a content management system (CMS) that allows you to easily publish content (i.e., blog entries). You can use your Emporium blog to create compelling content that builds trust among your buyers and drives more web traffic to your Emporium. Step 1. Add a blog entry. 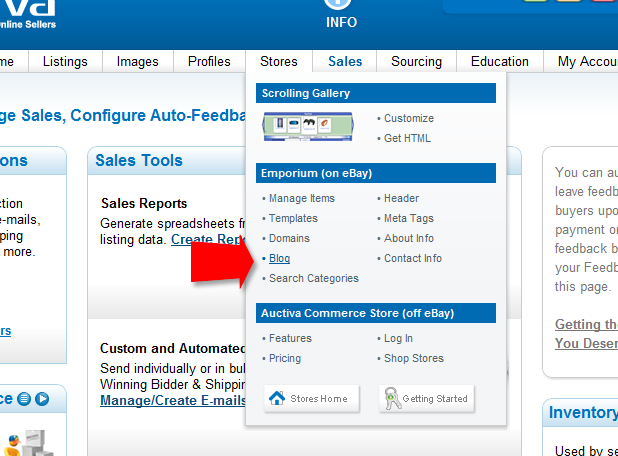 Hover your mouse over the Stores tab and click on the "Blog" link (Figure 1.1). The Blog Entries page will load. Click the "ON" link if you want to allow Web visitors to comment on your blog entries (Figure 1.2-A). 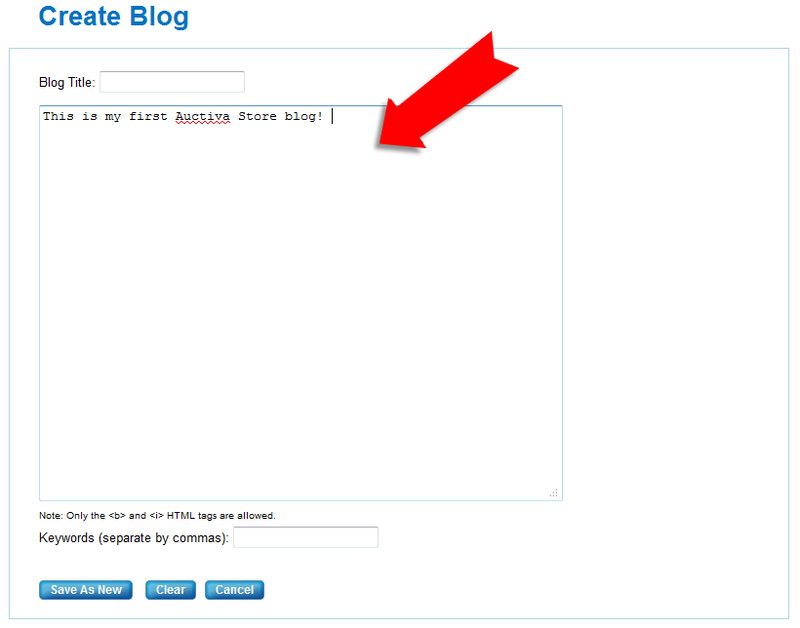 Click the Create New button to add a blog entry (Figure 1.2-B). Figure 1.1. Go to the Blog Entries page. Figure 1.2. Commenting options (A). Create a new blog entry (B). Blog Title: Enter the desired title for your blog entry. Enter your blog post in the content field (Figure 2). Keywords: Enter the desired keywords for this blog. Be sure to separate them with a comma. Click the Save As New button when finished. This blog entry will immediately post to your Emporium. Figure 2. Blog entry content field. You can continue to create more blog entries, as necessary. This completes the task of creating an Emporium blog. Blog about topics you know well. Draw buyers in with a creative headline. Use your blog to provide buyers with up-to-date information about your Emporium. Avoid misspellings and broken links. Include links to credible sources.